Tony is an artist currently living in Harkers Island, NC. His realistic watercolor paintings can be found in collections across America. “I see myself not only as an artist, but also a preservationist, and I love traveling the back roads of America. When I discover suitable subject matter of old stores, restaurants, mills or milling companies or anything else that catches my eye out on the highways, I photograph it from many angles. Then I take the photos back to my studio, picking and choosing elements until I arrive at a composition I’m happy with. Then I draw the image on my paper, and begin building up layers of watercolor until the painting is finished. Tony Craig studied art at Winthrop University in Rock Hill, SC and the California Institute of the Arts. He has worked as an artist in the animation industry for 29 years on shows ranging from “Tiny Toon Adventures” and “Animaniacs” at Warner Brothers, to serving as executive producer/director on “The Lion King’s Timon and Pumbaa”, “101 Dalmatians” (TV series), “Mickey MouseWorks”, “House of Mouse”, “Lilo and Stitch” (TV series), two video sequels to “Lilo and Stitch”, and “Mickey Mouse Clubhouse”, before moving home to NC and devoting more time to his own artwork. He still freelances on many current animation projects including “Scooby Doo Guess Who”, and “Craig of the Creek”. Along the way, Tony worked with such greats as Chuck Jones, Gene Kelly, Bill Hanna and Joe Barbera, and Roy E. Disney. In 2000, “Mickey MouseWorks” won the Annie (animation’s equivalent of an Oscar) for best animated half hour series. In 2006 Tony’s painting “Georgia Girl Drive In” was selected for inclusion in the Long Beach California’s Arts Council show, “Artists With Day Jobs”. While living in California, Tony was represented by the now closed Tirage Gallery in Pasadena, and took part in many shows, including a tribute to Route 66. “Barn Swallows” was selected from numerous entries to be included in the 2010 Wildlife in North Carolina Calendar. Tony’s photograph of Priddy’s Store at Sunset was the first place winner in the Core Sound Museum’s annual photography competition. Tony’s artwork and photographs can currently be seen at www.facebook.com/nextbendgallery. He has been interviewed in Southwest Art Magazine and the upcoming winter issue of American Road Magazine. His first book, Country Stores in North Carolina, has been well received. Tony is an artist currently living in Harkers Island, NC. 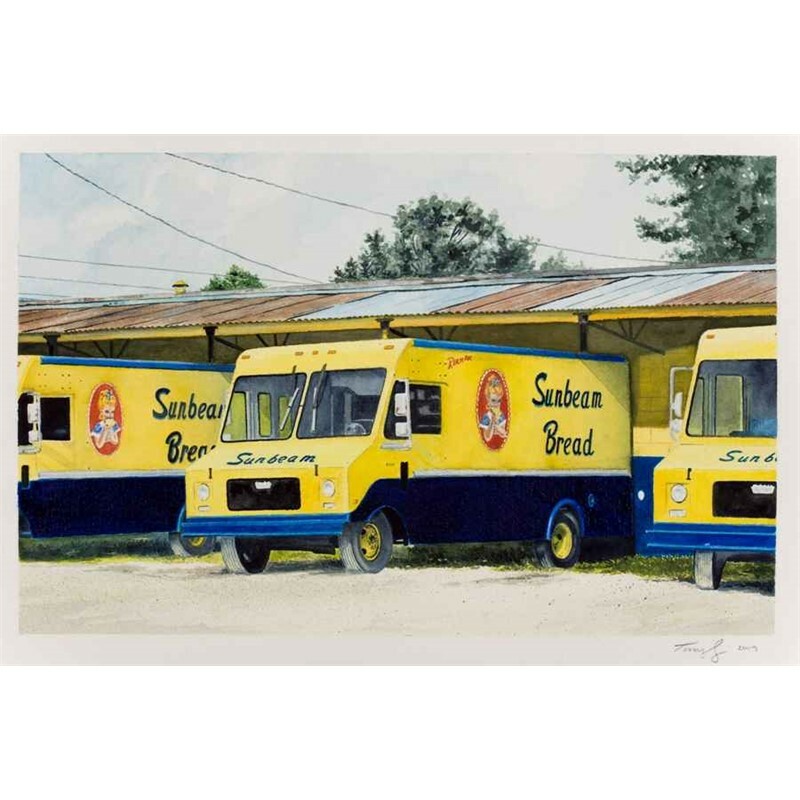 His realistic watercolor paintings can be found in collections across America. “I see myself not only as an artist, but also a preservationist, and I love traveling the back roads of America. When I discover suitable subject matter of old stores, restaurants, mills or milling companies or anything else that catches my eye out on the highways, I photograph it from many angles. Then I take the photos back to my studio, picking and choosing elements until I arrive at a composition I’m happy with. Then I draw the image on my paper, and begin building up layers of watercolor until the painting is finished. I hope to capture these wonderful places before they vanish from the landscape, and to reveal their beauty and importance to the viewers of my work. The images are not idealized. If the building is in bad shape, but still retaining some dignity, that’s how I paint it.” Tony Craig studied art at Winthrop University in Rock Hill, SC and the California Institute of the Arts. He has worked as an artist in the animation industry for 29 years on shows ranging from “Tiny Toon Adventures” and “Animaniacs” at Warner Brothers, to serving as executive producer/director on “The Lion King’s Timon and Pumbaa”, “101 Dalmatians” (TV series), “Mickey MouseWorks”, “House of Mouse”, “Lilo and Stitch” (TV series), two video sequels to “Lilo and Stitch”, and “Mickey Mouse Clubhouse”, before moving home to NC and devoting more time to his own artwork. He still freelances on many current animation projects including “Scooby Doo Guess Who”, and “Craig of the Creek”. Along the way, Tony worked with such greats as Chuck Jones, Gene Kelly, Bill Hanna and Joe Barbera, and Roy E. Disney. In 2000, “Mickey MouseWorks” won the Annie (animation’s equivalent of an Oscar) for best animated half hour series. In 2006 Tony’s painting “Georgia Girl Drive In” was selected for inclusion in the Long Beach California’s Arts Council show, “Artists With Day Jobs”. While living in California, Tony was represented by the now closed Tirage Gallery in Pasadena, and took part in many shows, including a tribute to Route 66. “Barn Swallows” was selected from numerous entries to be included in the 2010 Wildlife in North Carolina Calendar. Tony’s photograph of Priddy’s Store at Sunset was the first place winner in the Core Sound Museum’s annual photography competition. Tony’s artwork and photographs can currently be seen at www.facebook.com/nextbendgallery. He has been interviewed in Southwest Art Magazine and the upcoming winter issue of American Road Magazine. His first book, Country Stores in North Carolina, has been well received.